One of my new favorite places is the Bar Alfalfa that I mentioned before. 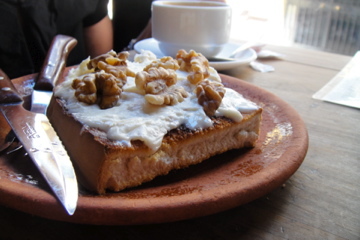 Here’s an example of what they offer for lunch… This is a tostada with Roquefort cheese and walnuts. 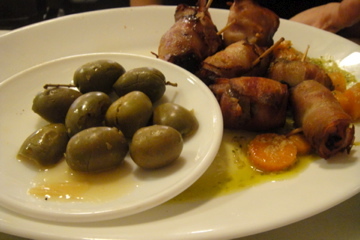 In Sevilla, you can find Roquefort (a kind of blue cheese) on everything- chicken, pork, potatoes and so on. Also, most people here use a fork and knife when we uncouth Americans might just pick something up to eat, like in the case of this tostada, or pizza. It’s a cultural adjustment! If you come to visit Spain (which you should! And visit me! 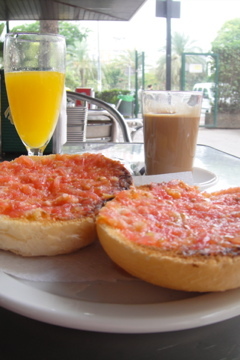 ), this is a super-typical breakfast: a tostada with tomato pulp and olive oil (tostada con tomate y aceite), fresh-squeezed orange juice, and a shot glass-size of café con leche. The coffee is more concentrated here, and usually very good, but I have to admit I miss Starbucks-sized coffees already. 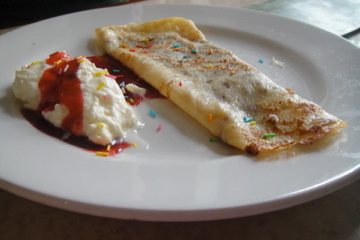 Aren’t the sprinkles a cute touch? More (many more!) food pics to come! Mamma Jenna!!! I am so happy you are enjoying España! The food looks muy delicioso, I can’t wait to see more pics. I am so happy you are doing this blog too. I will live vicariously through your travels and experiences tehe 😉 Glad all is well and I look forward to future posts. Love you!